When choosing a mattress, you’ll have to decide what material your new mattress will be. Two of the most popular types of mattresses on the market today are memory foam mattresses and spring mattresses. Both have their pro’s and con’s, and it’s important to carefully consider which is best for you before spending hundreds of dollars on a new mattress. Memory foam mattresses are mattresses that are made with high-tech memory foam. 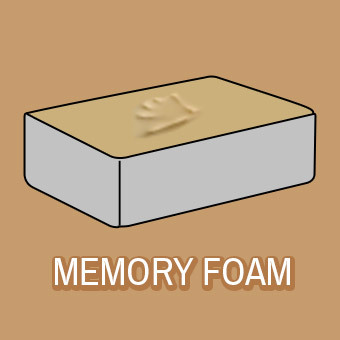 Memory foam is a type of polyurethane foam. It’s designed to absorb impact and cushion the body to provide superior support. Many people have found memory foam mattresses to be an extremely comfortable way to sleep. Because memory foam mattresses absorb the impact of your weight, they reduce pressure points on the body. If you’ve ever noticed that you wake up often during the night with pain, or that your back, hips, or shoulders are sore in the morning, you may want to consider a memory foam mattress. Memory foam can prevent this kind of soreness by cushioning your body, even at the pressure points where you put the most weight. A memory foam mattress is also a great option for couples. A traditional spring mattress sinks down and moves when one partner rolls over or climbs in bed. On the other hand, a memory foam mattress allows one partner to move without disturbing the other partner. If you have a partner that tosses and turns all night long, a memory foam mattress will allow you to remain undisturbed and sleep through the night. One of the biggest drawbacks of memory foam mattresses is the price. Memory foam mattresses tend to cost more than traditional spring mattresses. The process used to create memory foam is complex, and the science behind memory foam mattresses is relatively new, adding to the cost. However, a memory foam mattress can last longer than a spring mattress, so the extra cost may be worth it in the long run. Another complaint about these mattresses is the temperature. Due to the density of memory foam, the airflow of a memory foam mattress is somewhat restricted. Memory foam mattresses tend to get warmer than a spring mattress. This can cause significant discomfort for some sleepers. If you prefer memory foam mattresses over spring mattresses, you may find that you have to lower the temperature on your thermostat or sleep with a fan beside the bed. Spring mattresses are the traditional mattresses that have been found in bedrooms around the world for years. These mattresses are made with a series of steel coils that support your body. On top of the coils there is a thick layer of padding. The coils are usually individually wrapped to prevent them from sticking out of the mattress and creating discomfort. The number of coils in a spring mattress varies between different models. Mattresses with more coils can be more comfortable, offering more support as you sleep. However, it can be more important to have thicker coils made of strong, high-quality materials than to have lots of coils. A firm, supportive queen size mattress should have at least 400 coils. You’ll also want to check the gauge of the coils. The gauge will tell you how thick the coils in a spring mattress are. A lower number means the coils are thicker, and therefore will offer more support. Many people prefer spring mattresses over memory foam mattresses for a variety of reasons. First, there are more options when shopping for a spring mattress. 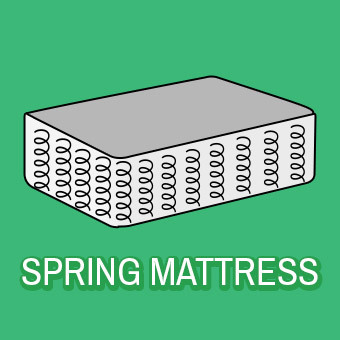 You can purchase spring mattresses with different coil counts and gauges. You can also purchase spring mattresses that have different kinds of padding on top of the coils. Since spring mattresses contain different components (coils and padding) rather than just one slab of foam, they are more customizable. If you are especially picky about your mattress, you may have an easier time finding a spring mattress that suits your needs. Spring mattresses are often cheaper than memory foam mattresses. This is not always the case, however. A high-end spring mattress can cost as much as, if not more, than a memory foam mattress. If you’re on a tight budget, however, you’ll likely find that it’s easier to find a spring mattress that fits your needs. Spring mattresses do have their drawbacks. If you suffer from chronic pain, a spring mattress might not bring you the relief that a memory foam mattress can. Because of the coil construction of a spring mattress, there may be certain pressure points in your body that aren’t supported by a spring mattress. It’s also important to do your research on a spring mattress before purchasing one. There are lots of affordable spring mattresses out there, but some cheap spring mattresses are simply low quality and will leave you with pain and soreness in the morning. A cheap mattress is never worth it—remember, you spend about 1/3 of your life in your bed, so you want it to be comfortable.